Give up your stones, voluntarily. See aspects of sacrifice for an overview. This stratagem has been codified in many Go proverbs, for example "If there are fewer than seven stones in danger, tenuki" (though that isn't meant seriously). It means that you should not hang on to your stones too much. Sacrifice unimportant stones to take the initiative (sente), make better shape, or gain a favourable position. If you try to save every stone, you will be burdened by having many weak groups. Usually it is better to have one strong group, instead of two weak groups - even if you have to sacrifice one of the two groups. Black is in a difficult position. The stones at the top are in great danger and the stones at the bottom are not too strong either. Here the best advice for Black is to sacrifice the plum for the peach (part of the Secret Art of War). This means that Black should sacrifice some stones in order to gain a better position. 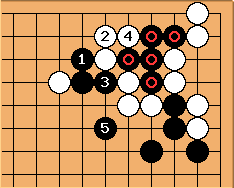 Black plays with the intention to sacrifce the marked stones. After the sequence through White has captured the stones, but Black has a radically improved position. 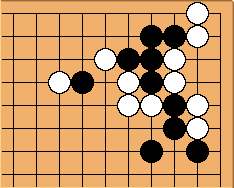 Because of , White is sealed into the corner and Black has gained outer influence. 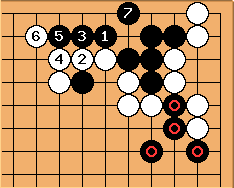 Compared with the diagram below or the starting position Black is satisfied. With through Black makes life for the upper group. But White effectively seals Black in. Furthermore, the marked black stones may still be of some worry later on.